I am six foot tall. That means that if I was to eat 6 Subway footlong sandwiches, I would be eating my body…height in delicious meatballs. That sounds much stranger than I intended but there is no arguing with the strength of the Subway franchise. Did you know that the sale of fast food increases significantly in times of bad economy? Did you know that before a new Subway franchise opens, the owner must head to a posh course in the US to learn how to become a sandwich artist? Did you know that Subway constantly has specials for as little as $6 a footlong? Did you know that too many rhetorical questions make a bad paragraph? You do now. There are two subways in Banff. 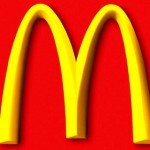 The addictive golden arches of McDonalds. The Golden Arches welcome you into a world of grease and salt. Say what you will about the biggest franchise in the world but it does what it says. Cheap food, fast food, lots of food – all check. It opens at 6:30am in Banff making it one of the handier options when you are rushing in the morning for breakfast. Amongst their particularly cheaper section, you will find coffee and muffin for $1.39. This is comfortably the best deal in town. You could say it is a HAPPY meal…or you could just enjoy it. There is plenty of seating and television screens constantly showing sports. Regardless of what you may have thought, Shakes is not a place where there are regular earthquakes. Rather, it is a very popular hangout for bubble tea, smoothies, hot dogs, fries, poutine and Vietnamese subs. The lovely Sue behind the counter told me: “When it’s cold, people tend to come in for the hotdogs but when it’s hot outside, people go crazy for the milkshakes and bubble tea. Because it is cold outside now we are making hot bubble tea. There is always specials on. Prices are pretty respectable between $4 and $8 for fast food. Good to know it won’t be a shakedown…sorry. 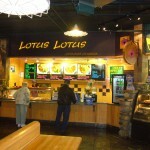 Lotus Lotus - so good they named it twice. Typically average Italian fast food. Ok pizza, decent pasta and friendly service. It fills the belly without too much substance. They have meal deals every day where you get rice, meat and a drink for $6.50. Though it can be a bit sweet as cheap Chinese food tends to be, it is still a very filling option. Good choice of sushi though a little more pricey than its competitors. It reads more like an Indian menu than anything but if you fancy a butter chicken curry in Banff for a cheaper price, this is a good option!